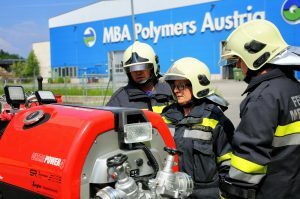 Since eleven years, the plastics recycling plant of MBA Polymers in Kematen has had an own company fire brigade. The most important undertaking of Fire-Brigade Commander Sonja Dattinger and her troops: to prevent the worst case. 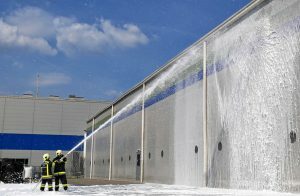 The firefighters are flocking on the factory grounds of MBA Polymers during this summery afternoon. „Water runs“, it sounds in a loud commanding tone. Seconds later a white foam mixture already spills over the wall of the new warehouse. Every handle has to be trained in order to avoid the evil – perhaps not today – in an emergency situation. Fortunately, this is just a simulation of an emergency. No fire to be seen near or wide; only the sun burns from the sky. In the middle of the training exercise process is the Fire-Brigade Commander Sonja Dattinger. 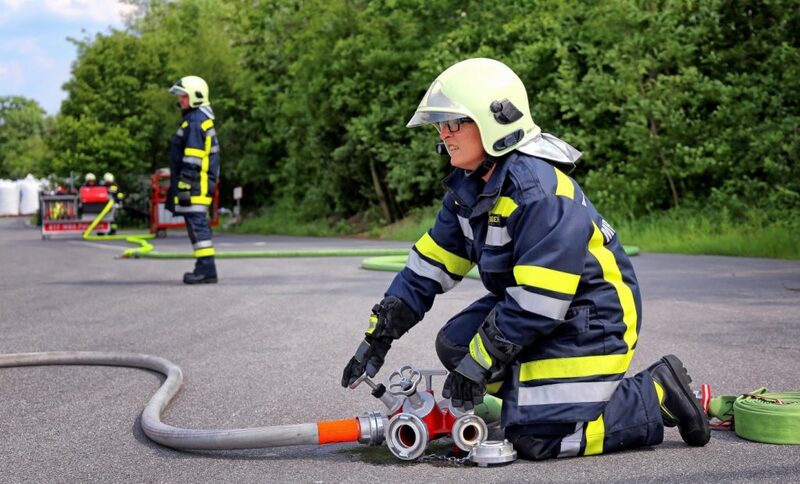 Since five years, she has taken over as commander of this MBA Polymers company fire-brigade. When it would come to an emergency, she knows very well that it all has to go very quick. „The first few minutes are of key importance. If a fire would develop within these recycled plastics, we only have a quarter of an hour to stop it“, she says. For such an emergency, over 500,000 litres of water are stored in a total of 7 cisterns, distributed over the entire area of ​​the plastics recycling facility. So far, fortunately, there has not been such a fire, but these exercises are done regularly. The company works in shifts, and this is recognized in the fire-brigade organization. In total the fire brigade consists of 43 men and women, most of them working in the production area. To ensure that the exercises do not interfere with the production flow in the factory, the timing of these exercises need to be planned carefully. On this hot day, MBA employees from two shifts are present, to practice the use of various foams as fire-extinguishing agents. There is no fire-brigade truck – you would look for a Fire Truck in vain. 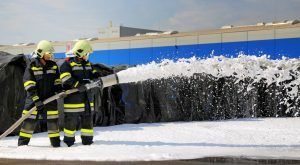 Instead, the MBA Polymers Fire-Brigade is equipped with a „special vehicle“: a custom made fire-fighting roll container with portable specialty pumps. This custom made vehicle was produced the southern Styria and it became a necessity after the MBA plant was supplemented with a new warehouse and a further extruder during the last round of expansions. With its two quick-action devices, the prescribed protection target can be achieved in the initial phase of any fire emergency. In order for this to work properly, these exercises serve to train the usage of this specialty device and its commands. Equally important for Commandant Sonja Dattinger is the issue of preventive fire protection actions. Here, the members of the company fire-brigade bring their entire knowledge into the game to reduce any fire-risks before an emergency can happen. The team has completely re-worked the original fire protection concept. In addition, any improvements proposed are discussed with the MBA fire protection officer every single month and resulting actions subsequently agreed with the plant management. „In the last few years, much has developed in the right direction,“ says Sonja Dattinger, concentrating again on the exercise. 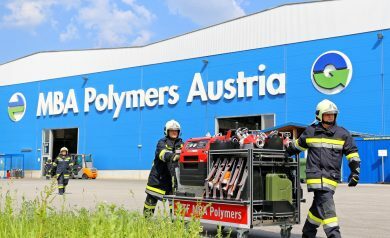 An important fact: the company fire brigade of MBA Polymers is one of only five operational company fire brigades in Lower Austria, prescribed by the authorities. Without the fire-brigade the production facility of MBA Polymers in Kematen would have to be stopped. But fortunately, the production machines run smoothly a few meters away from where the exercise is performed. Whilst ​​the foam carpet is getting higher and higher, freshly recycled plastics are coming out of the companies’ extruders at the same time. The members of the fire brigade have learned some important lessons this afternoon. Nevertheless, they all hope that the acquired knowledge only needs to be applied in simulations like these.